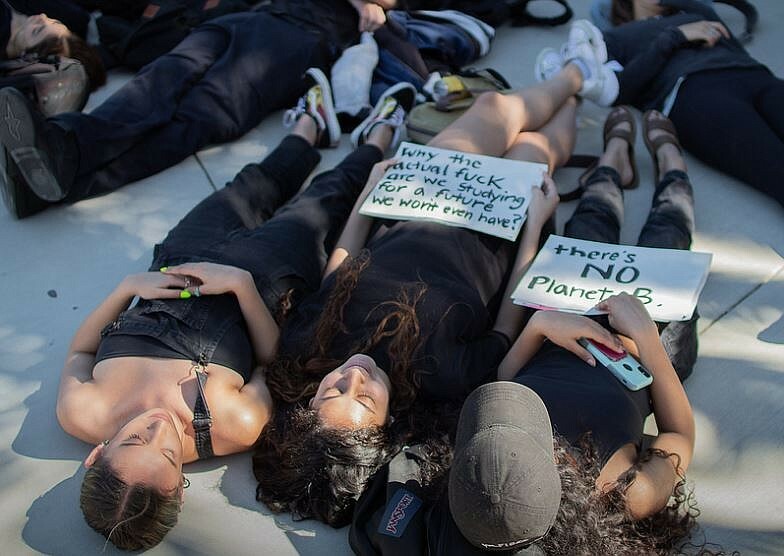 Photo: Reena Nanavati UCSB students held a symbolic "die in" as they took part in a worldwide climate change protest organized by young people on Friday. On Friday, students gathered in front of UC Santa Barbara’s library to strike in the name of climate justice. Participants wore black in memory of the lives that have been lost due to climate change impacts, including those lost in the Thomas Fire and Montecito mudslides. Many lay on the ground in a symbolic “die-in” to underline the dire consequences of taking no action. The group demanded a moratorium on any and all investments in fossil fuels and called for the Santa Barbara County Board of Supervisors to support the Green New Deal. The student group was one of thousands in more than 100 countries who left school to protest for climate change action on March 15. Photo: Reena NanavatiUCSB students held a symbolic “die in” as they took part in a worldwide climate change protest organized by young people on Friday.